This is a rather special book! I bought it last year when I visited Auschwitz and Birkenau Concentration Camp and it is published by the Publishing House of the State Museum in Oświęcim, which is the Polish name for Auschwitz. Birenbaum was a prisoner in Auschwitz, among others, while the war lasted. She was born in Warsaw in 1929 and grew up with the growing threat of Nazism and another world war. She survived for a long time in the Warsaw Ghetto and later she lived through Majdanek, Auschwitz, Ravensbrück and Neustad-Glewe with all the suffering that came along with them. She came of age under the Nazi terror, and she was only 15 years old when the war was over. This is Halina Birenbaum’s own account of how her life was affected by the Hitlerites, Nazism and the threat to the Jewish people. 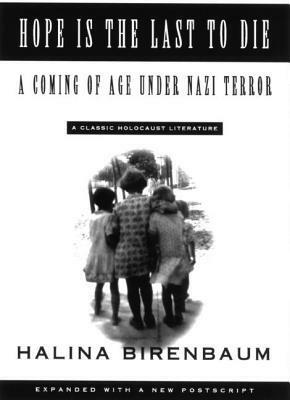 This book is considered as a classic in the Holocaust literature. Birenbaum writes in a first-person perspective, which isn’t too unusual when reading this kind of book, but she writes with such simplicity and clarity that you sometimes think it is a child who has written the story. At the time these events took place she was no more than a child, but the book wasn’t published until 1967, and still, she has kept the simplicity of a child’s memory and thoughts, and this really makes the book special. Sometimes within the book, there are comments like; When I look back at it now, or When I have thought about this later in life…..and this is the only time you remember that it is actually a grown-up who has written the book and not a child. The way Birenbaum describes her personal relationships is really touching and you can feel the love for her family and friends through the pages. They are described with the same simple and clear writing style. What I find particularly interesting is how Birenbaum describes herself while in the ghetto and the camps. Sometimes I feel like she looks at herself in a very negative light, while at other times she is quite positive. Anyone who lived through the concentration camps must have had some luck and a will of steel in my opinion, but through the book, you don’t get this impression of Birenbaum on a whole. I got the impression that she is rather weak in a way, leans heavily on other people to survive, and shifts between seeking comfort with people and seeking solitude within herself. In comparison with other books, I’ve read from these events I get the impression that Birenbaum felt a lot more than other prisoners whose stories I’ve read. Maybe it is so or maybe other survivors haven’t put that much emphasis on it? Then there are other sides to her that show willpower to survive, cleverness, and kindness towards other prisoners. I feel like she is a hero/anti-hero within her own story, does that make sense? What I think I want to get through is that she shows the reader both the positive and negative sides of herself. This is one of the greatest aspects of the book and it make the reading experience more powerful. I think I forget while reading this, how young she was at the time this all happened. She was 10 years old when the Nazis invaded Poland, she was sent to the camps in spring 1943 when she was 14 and this is a very delicate time in a young person life. This might also explain the hero/anti-hero perspectives. A teenager isn’t happy on all occasions and they act out. I believe you have an even better reason to act out whilst imprisoned with a death threat hanging over your head at all times. I’m so used to read books by grown-ups and I think this is why I think of her as one while reading the book. This is a fault of mine, which I don’t really appreciate, to be honest. I feel that it takes some of the genuine perspectives away from me. I’ll have to work on that! To sum up, this is a short, easy well-written and a well-formulated book that gives the reader a child’s perspective on life within the camps. I really enjoyed reading it and appreciated that it made me think about how I read books and how prone I have become to read these stories as though it is only grown-up survivors who have written down their stories. If you like Holocaust literature this book has to make its way onto your list! You’ll never regret it!